U.S. President Donald Trump arrives aboard Air Force One at Ninoy-Aquino International Airport in Manila, Philippines November 12, 2017. A week into his first trip to Asia, US President Donald Trump arrived in Manila on Sunday for the Association of Southeast Asian Nations’ annual summit, giving him what analysts said was the perfect platform to present his vision for the region and the ten-nation ASEAN bloc. Then again, his lack of vision for Southeast Asia might be on display instead, they said. 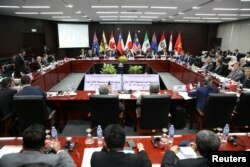 The summit is the most high-profile event of the year for the regional body, and plays a key role in multilateral efforts to resolve security and trade issues in Southeast Asia and beyond. However, Mr. Trump’s relationship to ASEAN first garnered headlines when he announced he would skip the bloc’s East Asia Summit, which brings together Southeast Asian leaders with those from superpowers such as China, Russia, and the US. The decision was interpreted by many in Southeast Asia as a lack of interest in multilateralism and the region in general. The president changed his mind only at the last minute, on Air Force One while headed to Asia. “I do not think that Donald Trump's presence at the upcoming ASEAN meetings says much about the notion of ASEAN centrality,” he said. “I suspect that Donald Trump will largely stick with his usual script by touching on his pet topics: the US's trade deficit with a number of countries in ASEAN and how this imbalance needs to be ‘corrected’; and a call on ASEAN member states to do more to contain the threat posed by North Korea,” the London-based analyst said. Chheang Vannarith, a research associate at the Institute of Southeast Studies in Singapore, agreed that ASEAN countries would likely have low expectations of Mr. Trump, particularly on economic and free trade issue. U.S. President Donald Trump attends the Association of Southeast Asian Nations (ASEAN) Summit gala dinner in Manila, Nov. 12, 2017. Still, he said the US president’s simple presence in Manila would be seen by Southeast Asians as evidence that they were still important to the superpower. In an era when many countries in the region are nervous about Beijing’s growing power, Mr. Trump would provide assurance that the US is still committed to counterbalancing China in terms of security. “ASEAN doesn’t expect much in particular, but the bloc wants to see commitment, determination and action from the US to keep the balance of power in the region through its role in the regional security aspect,” he added. “I have an honor in sharing our vision for a free and open Indo-Pacific—a place where sovereign and independent nations with diverse cultures and many different dreams can prosper side by side and thrive in freedom and in peace,” Mr. Trump said to businesspeople gathered in the coastal Vietnamese city of Da Nang. The new administration has been increasingly using the “Indo-Pacific” term over the past several months, phasing out “Asia” and “Asia-Pacific.” Scholars and analysts have suggested that the concept is intended to reframe the region as stretching from India to Australia, both key American allies, while decentering Beijing. “It is a strategic concept to draw participation from countries like India to resist the growing hegemonic power of China in the region,” Mr. Vannarith said. Shihoko Goto, a senior associate in the Asia Program at the Wilson Center in Washington, D.C., said a key point of interest at the ASEAN Summit would be watching how Mr. Trump deploys the term and explains the thinking behind it. “Having made a point of welcoming the idea of a more inclusive Asia-Pacific region through an Indo-Pacific network, there are more questions than answers that have come about as a result,” she said. Trade ministers and delegates from the remaining members of the Trans Pacific Partnership (TPP) attend the TPP Ministerial Meeting during the APEC 2017 in Da Nang, Vietnam November 9, 2017. Some analysts argue that Mr. Trump’s persistent theme of “America First” is inherently bad for the Southeast Asian nations, which need to stick together and ally themselves with stronger nations such as the US to counteract the political and economic hegemony of a rising China. The very concept behind ASEAN is rooted in ideals of multilateralism and free trade, they say. “If the US continues its "America First" policy, I am afraid the US will not be able to block China's rise in the region, at least on the economic front,” said Kaewkamol Pitakdumrongkit, an associate professor at Nanyang Technological University in Singapore. In his speech in Da Nang, Mr. Trump defended the decision to withdraw from the US-initiated Trans-Pacific Partnership, complaining about “chronic” trade imbalances while stressing the importance to the US of negotiating favorable bilateral trade agreements. “These echo his "America First" policy, which views trade as a zero-sum game (focusing on US trade deficits with its trading partners) and emphasizes bilateralism as a way to foster relationships between the US and other states, because the US thinks that these bilateral deals will maximize its chance of getting agreement terms favorable to itself,” said Ms. Kaewkamol. Given the new economic and political uncertainties created by Mr. Trump’s presidency, ASEAN leaders need to get more serious about strengthening the bloc’s ability and willingness to take the lead and “shape regional economic architectures,” she argued. 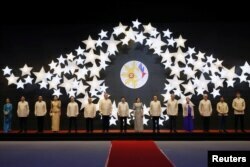 FILE - Philippine President Rodrigo Duterte, sixth from left, poses with descendants and representatives of the ASEAN Founding Fathers at the closing ceremony of the 50th ASEAN Foreign Ministers Meeting and its 50th Grand Celebration Tuesday Aug. 8, 2017. At the summit, Trump will sit side by side with a group of leaders frequently described as “authoritarian” and responsible for narrowing space for rights and democracy in the region. From Bangkok and Phnom Penh to Manila, Southeast Asian governments have been increasingly aggressive in targeting critics and dissenters this year. The Trump administration is not likely to abandon America’s traditional focus on human rights and democracy, which have been pillars of US foreign policy for decades, in dealing with Southeast Asian authoritarian leaders. However, they will likely be “back-seated” to “regain some leverage,” said Thitinan Pongsudhirak, a political scientist at Chulalongkorn University in Thailand. Mr. Thitinan, who is also the director of the Bangkok-based Institute of Security and International Studies, said Mr. Trump may have learned lessons from his predecessor Barack Obama’s struggles to promote democratic values among ASEAN leaders without “alienating” them, when they are needed to counter China’s ambitions in the South China Sea and the Mekong River. However, he said it was likely that technocrats and lower-level diplomats at various US embassies across the region would be relied on to ensure that democratic values and human rights continue to be priorities in US foreign policy. “It’s a matter of balance. We can see certainly that the US under President Trump has prioritized US interests over democratic values. However, I don’t see it as a matter of black or white.… It’s not like they have interests only and no values, but Trump is probably not going to prioritize democratic ideals, human rights and election during this visit,” he said.